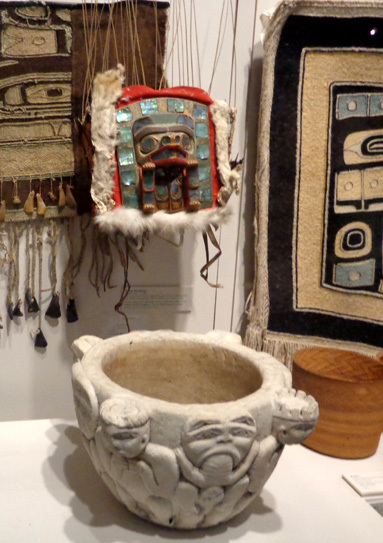 one of the country's most extensive collections of Alaska Native art and artifacts." This was another rainy day (off and on) so we planned mostly inside things to do. Temps remained in the 50s F. all day. That's pretty chilly in late July even by Anchorage standards, where the average high temperature this time of year is 65 F.
I love art, science, and history museums. 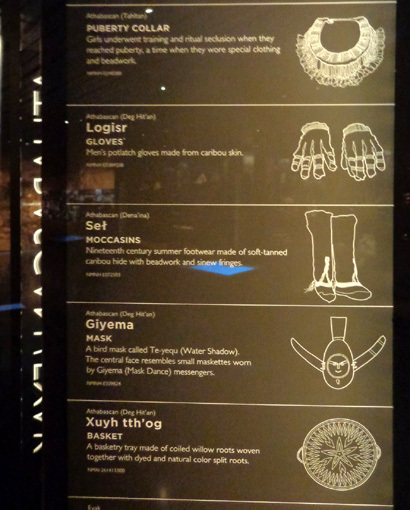 The Anchorage Museum covers all of those categories. 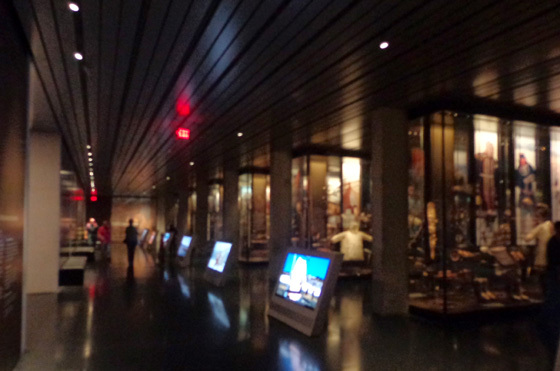 After reading about the museum's recent ten-year, $106 million renovation/expansion I had to see what was inside. Today was a perfect day to visit. 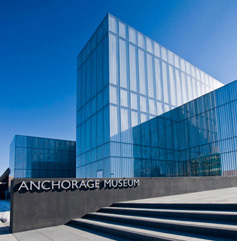 Bottom line: I'm totally impressed with this museum and highly recommend all visitors to Anchorage go see it. Sometimes I'm a real cheapskate but I feel like I got great value for my $9 entry fee (discounts are given for kids, seniors, military, etc.). Regular admission is $12 this year. Per the museum's website, if you have a Bank of America or Merrill Lynch card, you can get in free the first Saturday of the month. I didn't know that until later. Check the website or call the museum before visiting to see whether you qualify for any obscure discount like that. If I lived in the area I'd become a museum member and volunteer in some capacity at this magnificent place. It's a wonderful resource for the community and the state of Alaska. Bronze sculpture by Jim McCain titled, "Earth, Sea, Sky/Cycles of Alaska Seasons"
Jim's a bit museumed-out right now so he dropped me off downtown at the museum this morning and drove to Sam�s Club to get the tires rotated on the truck. 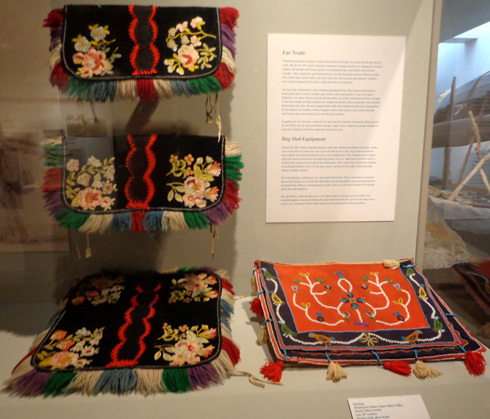 That took a while but I had plenty to keep me busy at the museum. He came back for me in what seemed like a blink of the eye because I had so much to see. 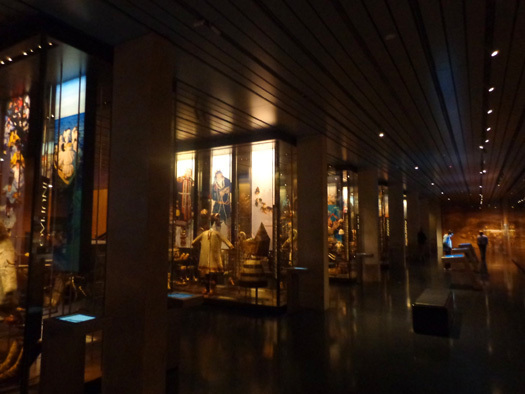 In real time I was at the museum for 2� hours. That barely gave me time to see all I wanted to see, however. I could easily spend a day in there. 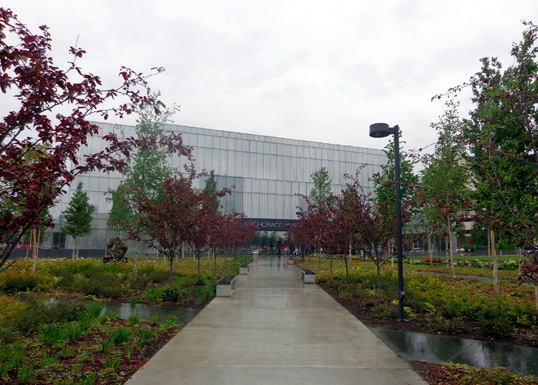 It is chock full of interesting art, history, and science exhibits. 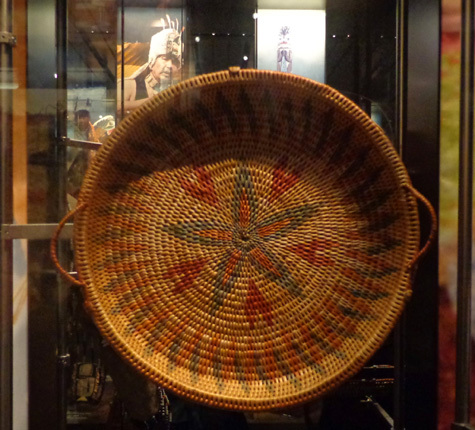 I want to go back sometime to see what exhibits have rotated in and out and to spend more time reading the information with the permanent exhibits. I'll encourage Jim to go with me the next time. I think he'll enjoy it, too. 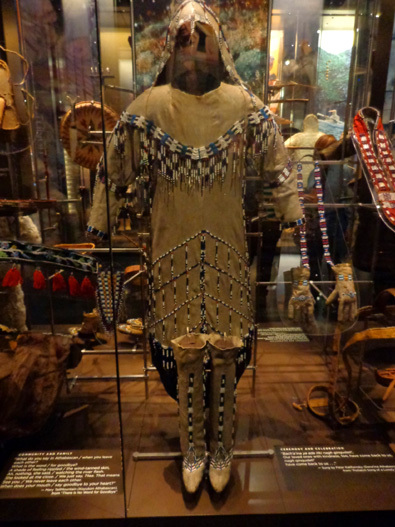 There is an excellent review and description of the museum in one of our visitors' guides: (WhereTraveler.com�s 2012 Alaska Where, the Complete Traveler�s Magazine: Bring on the Bears, p. 19) and in The Milepost book referenced above. My information in this entry also comes from the museum's very professional website. 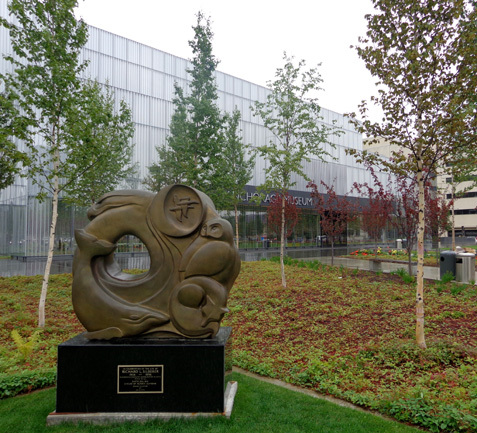 The Anchorage Museum and beautiful park-like entrance, called The Common, cover two full city blocks in downtown Anchorage. I took a lot of photos of the landscaping and flowers. Some are shown in this entry. I'll save others for a separate entry about the city's beautiful cultivated floral displays. 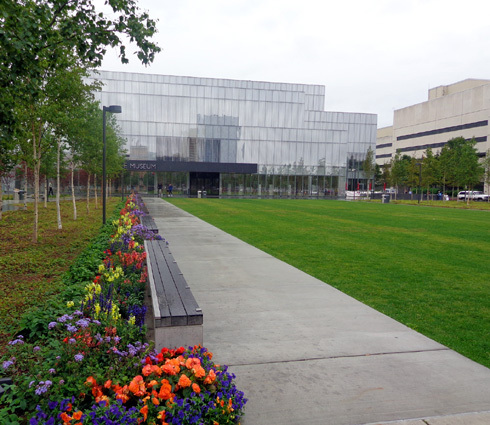 The new section of the building, completed two years ago, has a stunning four-story fa�ade made with double-pane glass panels that have shades inside. They can be used to conserve energy and protect exhibits from damaging ultraviolet light. The addition (west wing) has four floors. The original museum (east wing) has two floors. You can see a map of the building here. 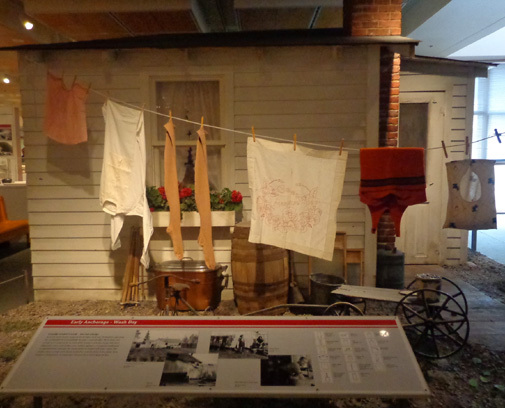 Locally produced and recycled products were used as much as possible in the new addition. 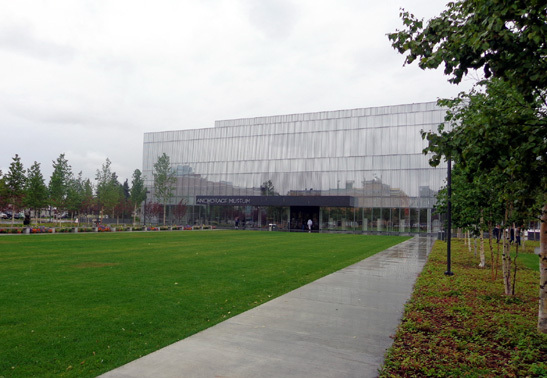 The whole building qualifies for certification in a national energy and environmental design program. Even before I knew all that, I was struck by the beauty of the place inside and out. It just feels good to be there. When I paid my admission I was encouraged to begin my visit on the second floor of the new wing. That was good advice, because it was my favorite part of the museum and I spent the most time there. 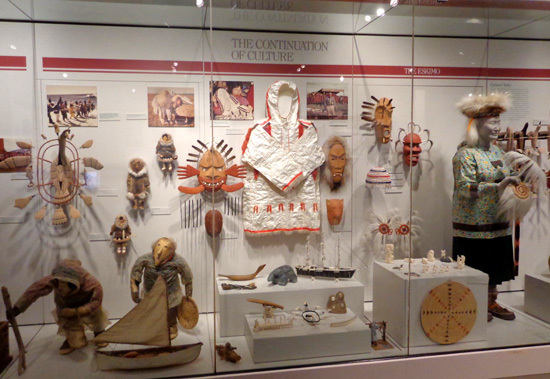 The flagship exhibit is called Living Our Cultures, Sharing Our Heritage: The First Peoples of Alaska. 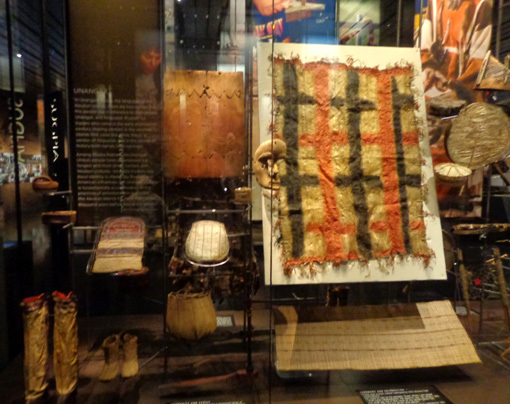 This very large exhibit encompasses all eleven (or more) cultures that have inhabited the region for over 10,000 years. 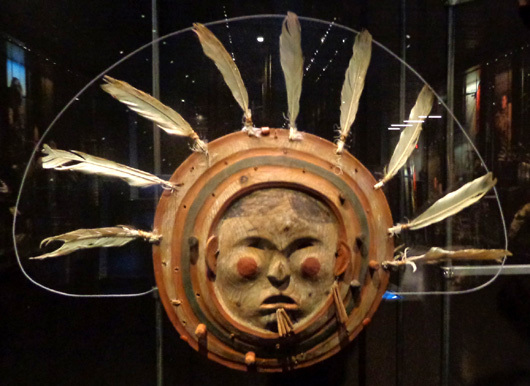 The display includes an extensive collection of Native Alaskan objects that were formerly housed or exhibited at the Smithsonian Museum in Washington, DC. 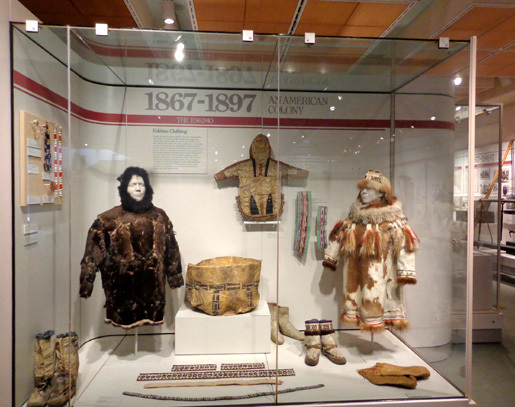 The extra space in the new wing allows the Anchorage Museum to display many more artifacts and art works than it could previously. 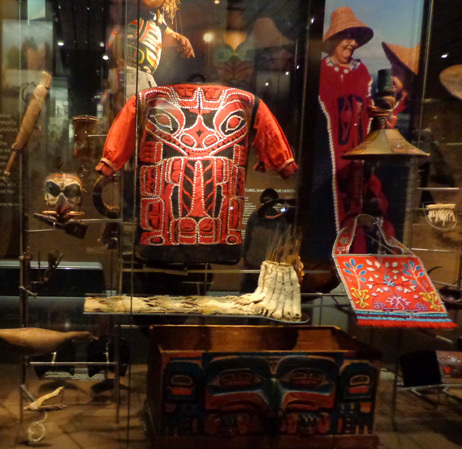 Each Alaska Native cultural display is housed in a separate large glass showcase that includes representative clothing, masks and other ceremonial garb, artwork, tools, and various household objects. 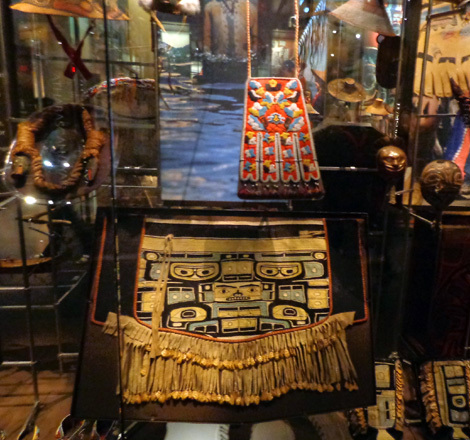 I took several dozen photos of items in the showcases. There are thousands of interesting items; only a few of them are shown here. Touch screens at the ends of each display case allow visitors to zoom in on photos of many of the objects inside to learn more about them through oral histories and archival images. I spent a while playing with that intriguing feature at several of the display cases, which decreased the time I had to spend in other parts of the museum. 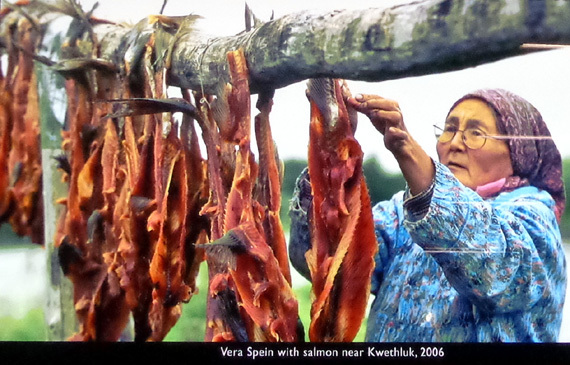 Another area in this exhibit that is separated by a partial wall from the showcases and video art installation is a sound-art display where visitors can listen to Native storytellers and sounds from the natural environment. I didn't have much time to listen to those stories today. 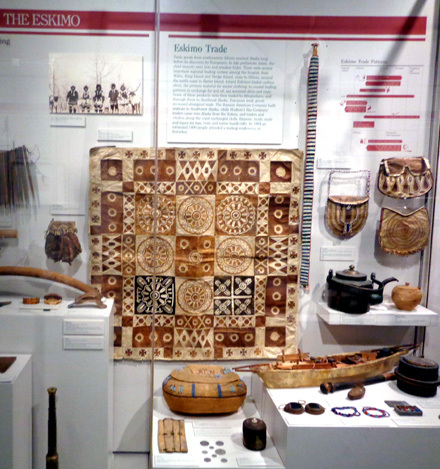 This is another very large exhibit located on the second floor. While I was wandering through the displays a docent (on the left in the next photo) was giving several visitors a narrated tour. I'd like to go back sometime and listen to all that information but I didn't have time for it today. 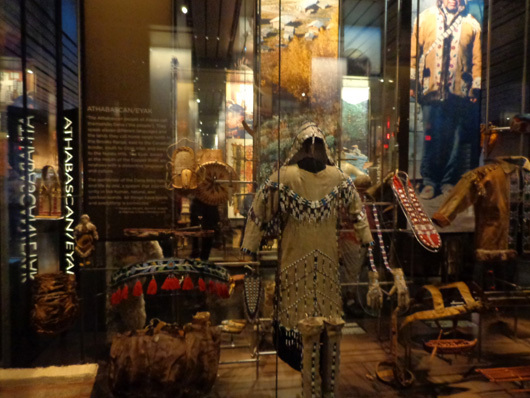 This gallery includes permanent exhibits of artifacts and art representing Alaskan history and culture. 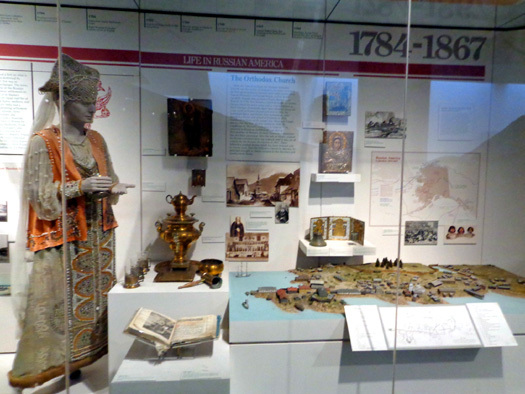 There are maps, photos, full-scale displays, and dioramas. 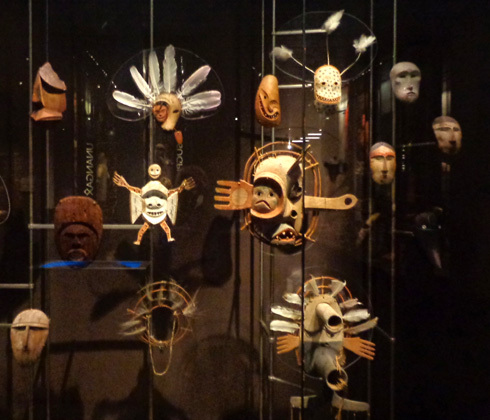 Subjects include centuries of Alaska Native cultures, the Russian occupation, the gold rush, WWII, statehood, and contemporary history. 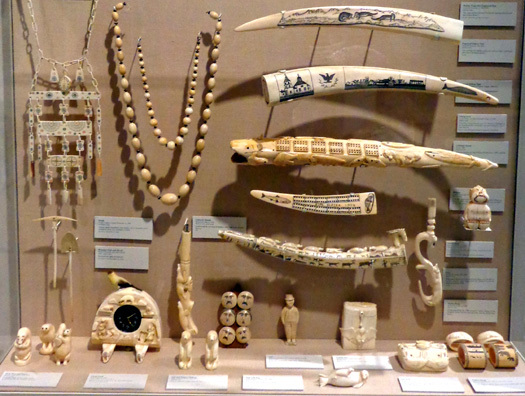 Eskimo carved ivory pieces,; some are hundreds of years old. 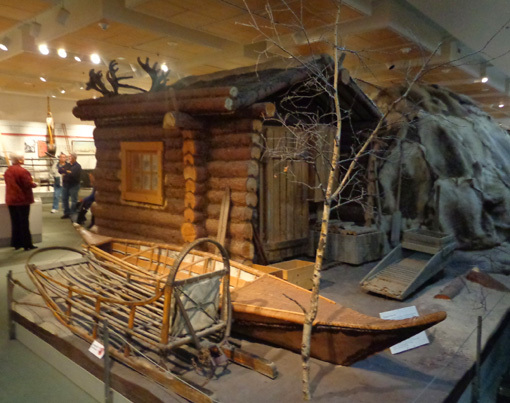 There are many more exhibits in the Alaskan History gallery. I had to zip through it to have time to see what else the museum offers. 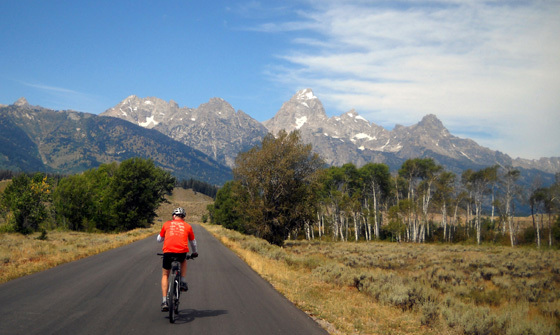 Keep going to see what else is there.